Hello Friends, I have to make it short and sweet today as I am still playing catch up from my week in Seattle. 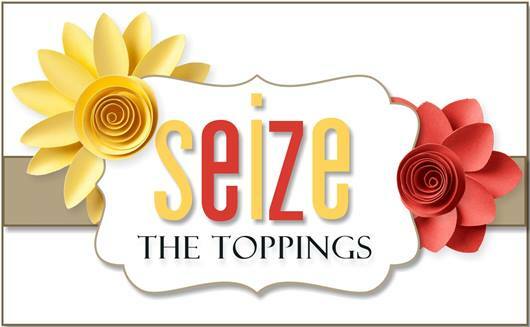 It’s time for a new challenge over at Seize the Birthday and our topping this time around is to use a Holiday stamp to make a Birthday card. A friend of mine cut out these awesome die cuts for a few of her friends and I at a card party and this is the layout I came up with. This type of card is called a Side Step card and I have linked up a tutorial that we all used here! I added the Birthday Sentiment from SU, as I knew this challenge was coming up, hope it doesn’t look out of place! Hope you come on over to Seize the Birthday and join us and while your there help us welcome our latest Surprise Party Guest Tanja! Here is a link to her wonderful blog Little Art College. Welcome Tanja….so glad to have you with us the next couple of months! Categories: Cards | Tags: Card making, Cards, Christmas, rubber stamps, stamping, Stamping Up | Permalink. FANTASTIC! Love the border die cut, so cute! A black and white Christmas card is so cool, I actually made one last year myself…not as elaborate as yours of course! Such a gorgeous card for a winter birthday. I adore what you did with the side step design. Love all of the stamps and dies you used on it too! This card is amazing. Love your colour scheme and the design. 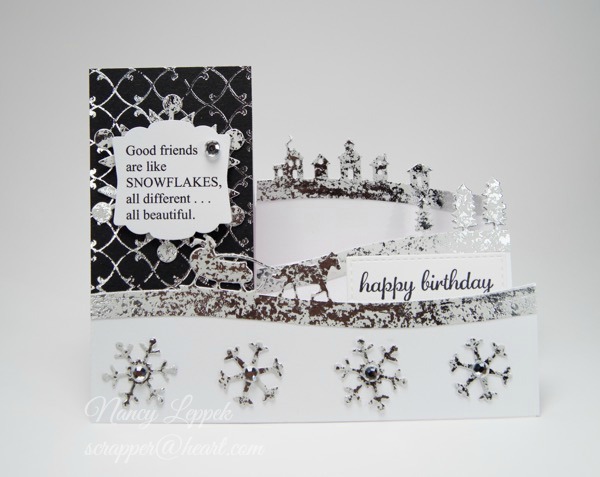 Side step cards add a whole different concept to a card, Nancy, and your images are perfect for one. I love the sentiment, too.